• The most important feature of the quad is the camera. The Syma X5C Quadcopter Drone comes with a 2 MP camera. In fact it is the latest addition from Syma in the quad world. The camera gives you a new experience of aerial photography. Also, it can be detached and attached again according to your needs and convenience. The HD camera records pictures and videos and stores them on an external SDHC card for viewing at a later time. • The manufacturers have taken extra care of the stability and durability of the device. It comes with an option pop guard. Sometimes when you need to give your drone a little extra protection you can opt for the pop guard. At all other times, you can enjoy an enhanced flight experience without it. Even though the HD camera is known to do wonders, but its frame rate is slow. This mean when the drone takes up speed, the camera can’t much up and gives blurry images. • There have been reports of the extra pop guard detaching itself and falling down during high speed flights. This is something that the company can work on for future products. • The battery life could have a few updates since it runs out pretty fast. In spite of the extra batteries, the flight becomes interrupted. If you have been looking for quadcopters, you must have gone through a lot of quadcopter reviews so that you can get yourself that perfect little drone. Quadcopters are small device, ranging on an average 6 to 12 inches long. But their size doesn’t do justice to the functions and utility of the product. 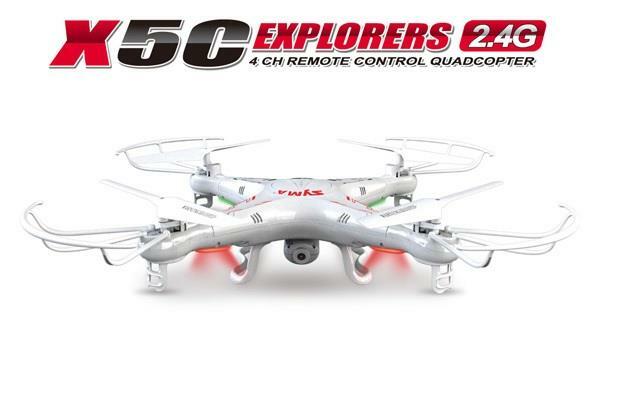 The Syma X5C Quadcopter Drone quad is the best example of the functioning of a quad copter. The Syma X5C Quadcopter Drone quad is a very handy device to possess at home. It is suitable for both indoor and outdoor activities. It can do wonders going around the house, taking the aerial route. Or, it can also give you the slight edge by taking your flying adventures outdoors, in the lawn or garden or the likes. It is a sturdy device that can protect itself from a few crashes during the early flying days. According to customer reports, this has proved to be the most stable flying drone that incorporates all the essential features and more. This 12 inch product does wonders to the flying experience. The maximum the quad can fly is around 35 meters and it does so in style. An extra battery comes with the packaging to ensure longer flying times. This takes care of the battery life issues to an extent. But overall, this drone is well recommended. This is mainly because of its stability during flight journeys. It comes with various flip options that make it easy to navigate. The six axis gyro has been working rather well and satisfying customers at all stages. This sturdy quad will not let you down. This 12 inch drone is one of the best quadcopters with camera, and you can give it a try for a blissful flight experience, whether you are a beginner or pro!